After falling down 10-4 early against a feisty visiting Wagner team at the Dunkin’ Donuts Center, the Friars were able to put together an incredible 31-0 run during the first half, effectively putting the game away and comfortably winning their first game after a week off from basketball to take care of business in the classroom for finals at PC. A few things contributed to the slow start out of the gates for the Friars. They needed a couple of minutes of game time in order to shake off the cobwebs of the extended time away from actual games. The early tip time (noon) and the fact that the students are on winter break (the band included) and just finished finals took the crowd out of it early in the contest as well. I’m sure the snow didn’t help with the local crowd getting to the game either. 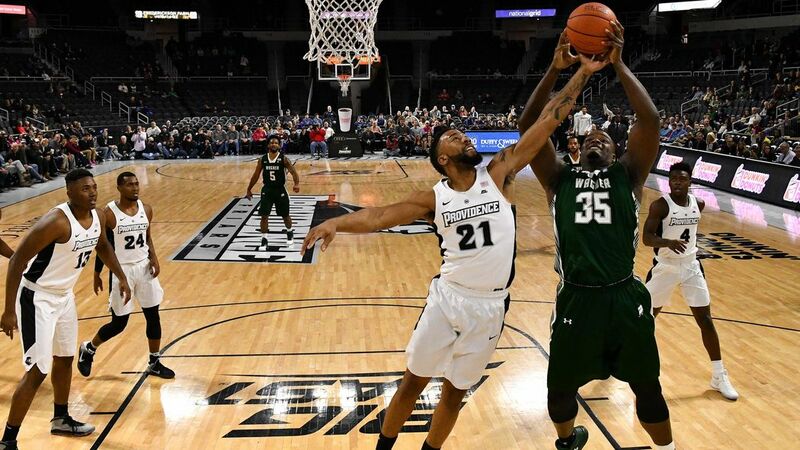 During the 31-0 run for the Friars that lasted about 13 minutes of game time, Providence was able to turn Wagner over 7 times and hold the Seahawks to shooting 0-16 over the stretch. I’m sure it felt like an even longer time for the players on Wagner. The Friars defense has been their signature all year and today’s game was no exception. The defense turns into easy offense on the other end of the floor. The win is the fifth in a row for the Friars and is now the fourth consecutive game with a different leading scorer for the team. Rodney Bullock has 26 pts against UMass, Emmitt Holt had 20 pts against Brown, and Kyron Cartwright had 19 pts against URI. Jalen Lindsey lead the team this time against Wagner with 16 points, followed by an even distribution of scoring from Emmitt Holt (11), Alpha Diallo (9), and Rodney Bullock (8). Ten players were able to get on to the scoring sheet in this one, each scoring at least 4 points in a well balanced Friar effort. Let’s talk about what has become an absolutely stifling defense for Ed Cooley’s squad. Wagner has 20 turnovers and just 8 assists. The Seahawks shot 33.3% from the floor and just 25.0% from three. Prior to the game, the Friars were giving up just 59.4 points per game, good for 11th in all of College Basketball. Guess what, they only gave up 54 today and that was with some point fluffing at the end of the game on a couple of easy baskets for Wagner, so that points per game is coming down. We’ll get to Jalen Lindsey, but I want to start with the Freshmen today. Since the Friars were able to open up such an early lead, the Freshmen trio of Alpha Diallo, Maliek White, and Kalif Young were able to get some extended minutes and each one of them stepped up when their name was called in this one. The three of them combined to go 10-12 from the floor. Alpha Diallo had what I think was his best game as a Friar (I seem to be saying this every couple of games). In 20 minutes of action, the New York guard was able to show off on both the offensive and defensive side of the ball. Diallo was 4-6 from the floor, drilling his only shot from distance. He was also able to grab 3 boards and continues to show an ability to rebound well from the guard spot, following up a 7 rebound performance against UMass. His length not only lets him be a factor on the glass but also led to a career-high 4 steals. It always helps to have a point guard as good at finding you as Kyron Cartwright is. Not to be outdone by Diallo, Maliek White excelled in his 19 minutes of game time, matching his season high in playing time from the first game of the season against Vermont. White didn’t miss a shot on the day, going 3-3 from the field, including one from long range. I’d like to see him limit the turnovers (3) but that’s just me nitpicking in a game in which everyone played well. Also wanting to get in on the dunkfest, Maliek threw one down out of nowhere on the fast break. I can get used to this. Young is a hustler, no other way around it. Kalif was 3-4 from the field for 7 points and showed off his passing ability on some nice looks. Jalen Lindsey was all-around fantastic. Lindsey was able to rack up a team-high 16 points on just 5 shots on the day. The Junior Forward went 4-5 from the floor including 3-4 from downtown. He continues to shot the ball confidently and effectively from the outside this season, and always within the flow of the offense. Lindsey is now shooting 46.5% from deep, up almost 20% from last year. Wow. Not done yet, Lindsey (an underrated rebounder) snagged 8 boards, swiped 2 steals, and handed out 2 assists. Jalen has been active for loose balls and was aggressive in going for rebounds in this game, using his effort plays to get to the line, going 5-6 from the charity stripe. Kyron Cartwright was the conductor that drove the PC train once again. Cartwright dished out 11 assists to just 2 turnovers. This isn’t the first time that Cartwright had more assists than the team the Friars were playing. This time he won the battle 11 to 8. Cartwright always makes the extra pass, passing up a good shot for a great one. Rodney Bullock was actually a little off offensively, going just 3-10 from the field for 8 points, but his offensive production really wasn’t needed in this game. The great thing about Bullock is, even when he’s not feeling it offensively, he can effect the game in other ways. Rodney took down a game-high 9 rebounds and played stellar defense, blocking 2 shots and recording a steal. For no other reason except for everyone else having a great game, Emmitt Holt’s effort kind of fell under the radar, even though he was 3-7 from the field for 11 points with 4 rebounds, 2 assists, 1 block, and 0 turnovers. That’s in just 22 minutes of playing time. Not too bad of a stat line in limited minutes if you ask me. Whenever Drew Edwards is in the game, good things seem to happen. Very active hands from the Sophomore. Ryan Fazekas was unable to hit a three, going 0-3. His minutes seem to be decreasing game by game and he has only been able to make a three in 2 of the last 6 games, playing under 20 minutes in each contest. I think it will depend on the matchup in which games we will see more Fazekas rather than less. I think it takes him a little while to get into the flow of the offense so it might be a matter of getting more consistent minutes in order to produce more offensively. On a different note, I think Fazekas has been very solid defensively this year and especially over the last couple of games when he sees action. Isaiah Jackson started his 4th game in a row in Fazekas’ stead but only ended up playing 13 minutes against Wagner. He was able to record two of the more memorable moments of the game anyway. It was one of those kind of games for the Friars. We were able to get a glimpse of the Friars Death Lineup with Casey Woodring and Tommy Planek but unfortunately no highlights in this one. Up Next, the Friars look to improve on their 8-0 record at home as they take on Maine on Tuesday at 8:30 PM to finish up a 6 game home stand. You can catch the game on FS1.